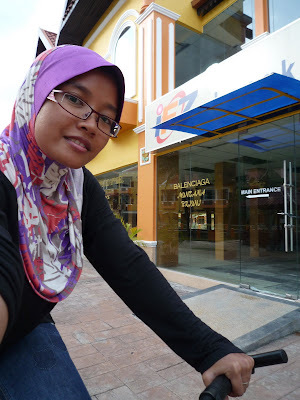 ...stand for Cycle Network Langkawi based in Langkawi. The shop and located at Langkawi Cable Car (Oriental Village). Owned by Ahmad Fairuz. After settling the flat screen at CICLI, i went to the food court behind to have a fresh mango juice and a set of bread. Then i start setting up CICLI blog and facebook. 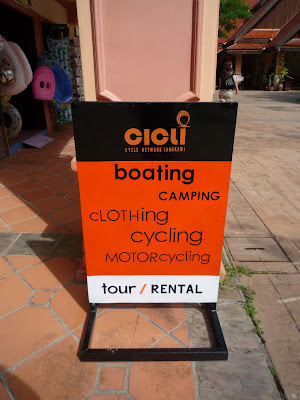 CICLI has it showroom at Oriental Village, selling merchandise such as T-shirt, haversack, camping tools, accessories bicycle, motorcycle rental and etc. When i first step into the shop, since months ago... i was admired by the deco inside. From outside we can see bicycles and motorcycles for rental...CICLI also have hand painting T-shirt... it was nice...simple but a great souvenirs. 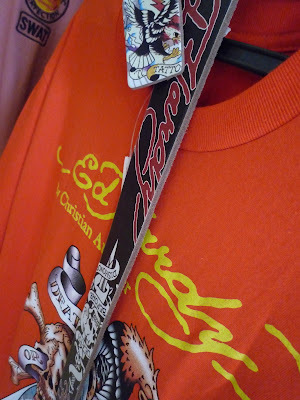 The inside of the shop full of accessories, T-shirt of various styles, haversack and many more. I went to the cable car counter. I had a wonderful evening... i'm sure will do that more often. kedai abg uih ke?best2!haha.padan muke pegi cycling sorang2 xde sape teman..
tp mcm best je.sbb sane kn mcm sejuk jgk la kn..
yup...mmg best...ikan dia makan popcorn..
sonot g nilai? nilai 3 ke nilai 1? ke g due2 sekali gus?